I discovered this book, as I often do, by trolling online. Viewing the cover of The Santa Trap, my credit card was once again lured out of the fetid darkness of my purse and into the light of literary (and consumer) joy. 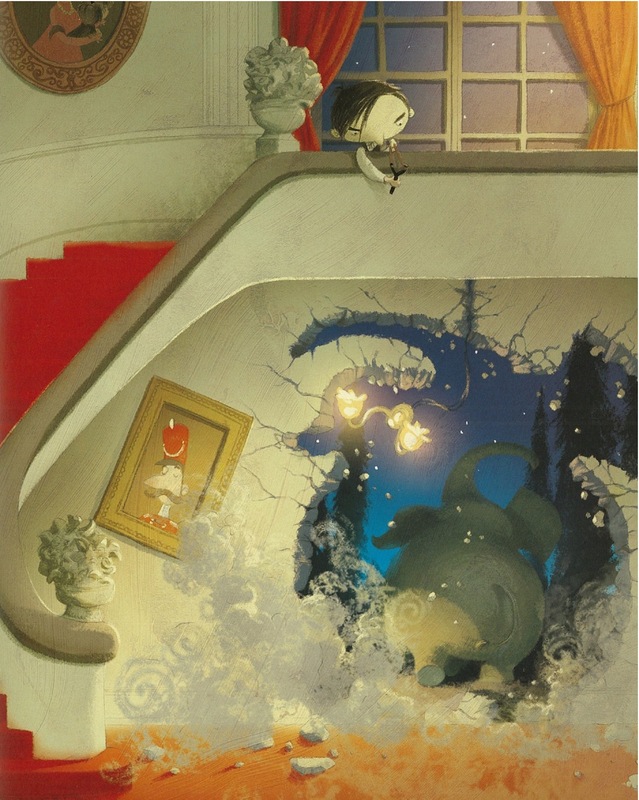 Now that I’ve read the book several times, and poured over the luminous illustrations by Argentinian artist Poly Bernatene, I am of course, hooked. Everything about this book is a joy, and with all the Holy Seriousness found in so many of the festive selections this time of year, it’s awfully nice to find a book that is just flat out funny. Bradley’s wealthy but broken down, fear-ridden parents have the means to give their son everything he wants, but young Bartleby’s appetites are insatiable, and devious. Every attempt to placate his greediness has failed to calm this savage beast, including an elephant who was so badly mistreated it escaped into the garden. And it’s not so much what he’s getting, but what he’s not getting, and from whom. Each Christmas, in spite of the huge list of demands typed up by hired secretaries, the only present Bradley has ever received from Santa is a pair of socks. 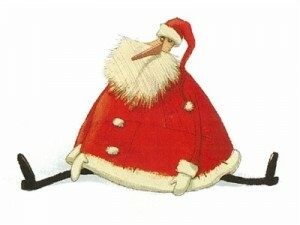 (Apparently lumps of coal are no longer environmentally responsible gifts for the naughty and the not so nice.) Master Bartleby, with his Hitleresque side-swept bangs and his natural born sense of entitlement, will not stand for this. He devises an elaborate trap for Santa Claus, which will take an entire year to build and whose sole purpose is “to catch the fat fool and take every present he’s got.” OK Bradley, hope ya like Justin Bieber, because this is apparently the hot toy of 2010, and there’s bound to be more than a few in Santa’s bag this year. 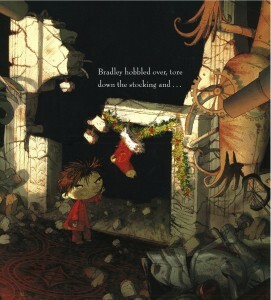 When Christmas Eve finally arrives, Bradley is so exhausted by his sinister efforts, he falls asleep, only to be awoken just before midnight by the roar of an angry tiger, whose tail has just been stepped on by an elephant. Feeling chilled, Bradley lights a fire, forgetting that he’s packed the chimney with dynamite. The ensuing explosion blows Bradley right into the middle of six snarling tigers (stolen from the local zoo), and so on…until all of Bradley’s ‘traps’ are visited upon him, one by one. Just as he reaches for the last thing not destroyed by the explosion, his Christmas stocking, an iron cage drops over his head. With a heavy sigh, the boy admits defeat, and empties his stocking on to the floor. Out tumbles a big box of bandages, and a brand new pair of socks. Love Santa. 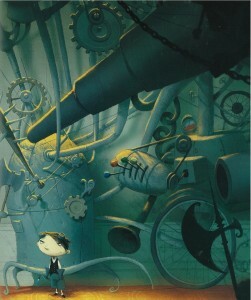 Poly Bernatene channels his inner Rube Goldberg in the depiction of Bartleby’s sick Santa Catcher, with the wheels and pulleys, hatchets, sticks of dynamite and trap doors, to the afforementioned live tigers. (Young Bartleby’s contraption is so dangerous, the parents move into a hotel, leaving more room, I suppose, for the Social Service agents which are sure to follow.) Especially amusing are the shadowy glimpses of the bewildered elephant in the garden, and Santa, delivering his Karmically-inspired present in spite of the chaos. Bernatene’s illustrations of are great gobs of gorgeous fun. Their dark elegance reminds me of the industrial scenes in The Rabbits, by Shaun Tan, and in fact I would go as far to suggest that Poly Bernatene is the Artentinian Tan. 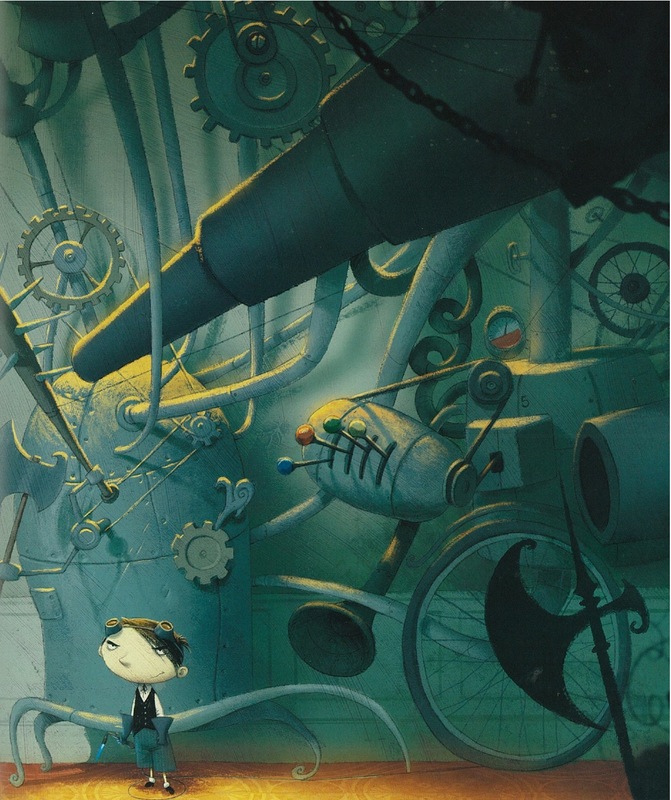 Both artists are working at the top of their respective games, although many, if not all of Bernatene’s illustrations were created in Photoshop, whereas Tan is old school acrylic and oil. 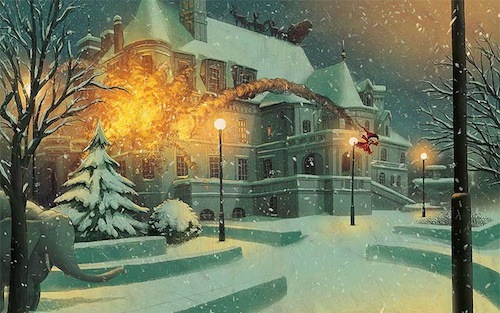 I am an old school person in my tastes, but with The Santa Trap, the medium is irrelevant. It’s the gobsmacking talent behind the paintings, and of course, the words, that makes this book among the best in my collection. although money may be involved as I am now compelled to own every book by this artist. Trained in drawing and painting at the Buenos Aires School of Fine Art, where he is currently a visiting professor, I was surprised to read that he has illustrated more than 60 children’s books. I think I need a second job. The wickedly clever Jonathan Emmett was born in Leicestershire, England. 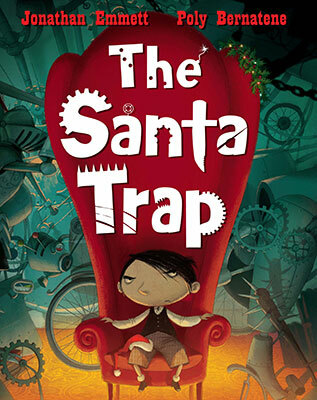 According to his bio, The Santa Trap was inspired by actual Santa traps he built as a boy, though I will assume they were not quite as elaborate, or as lethal, as the one he envisioned for this book. Still, although Santa might disagree, there is much to admire in this type of childhood initiative. Thankfully Emmett’s um…socially unacceptable pursuits have now been successfully channeled into other more conventional forms of creativity , such as writing about socially unacceptable pursuits. I have no doubt both author and illustrator will find something more substantial than a pair of socks in their stockings this Christmas. But I gotta ask, what’s wrong with socks? I must be getting old. And for an additional serving of Brat, may I suggest Thing-Thing, by Cary Fagan? It’s very tasty indeed.